Charles Duhigg (MBA 2003) is a Pulitzer- Prize winning journalist and a New York Times best-selling author. His first book, The Power of Habit, focused the science of habit formation, and his second, Smarter Faster Better, focused on the science of productivity. 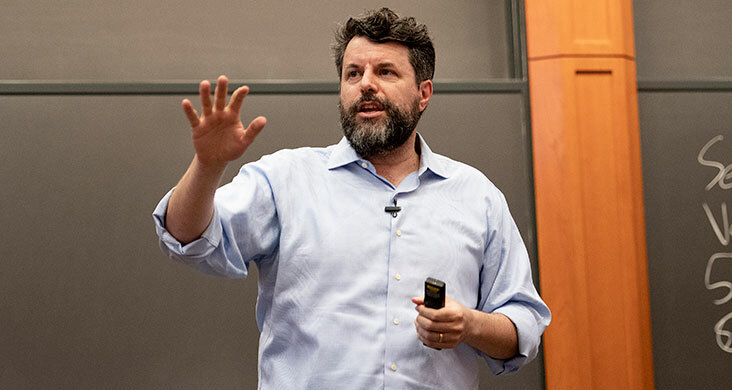 During spring reunions this year, Duhigg spoke to alumni about his next potential project: understanding the science of a meaningful life. Essentially, how can we live lives that are not just happy but truly meaningful, and what are the conditions that create that meaning? To illustrate his ideas, he told the story of a fateful 2010 flight from Singapore to Sydney. 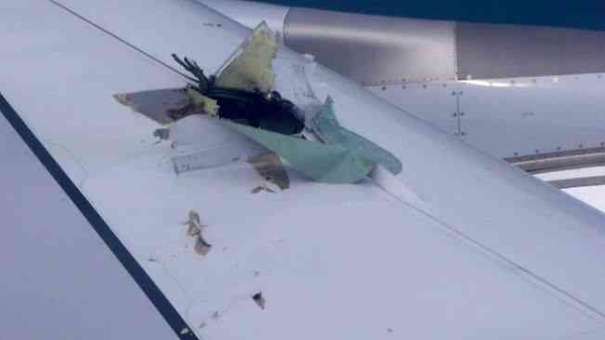 The hole in the wing of Qantas Flight 32. What do we know about why some experiences give you the sense of progress, give you the sense of accomplishment that you're reaching some potential, you're achieving something new? What are the preconditions that make some hard moments more meaningful than others? To answer this I want to tell you one more story. This is a story about Qantas flight 32. Now before I tell the story, how many of you flew to the reunion-- flew to the reunion, came to the reunion on a plane? OK, you're going to love this story when you're flying back. So Qantas flight 32 is this flight that took off in 2010 from Singapore to Sydney, Australia. It's an Airbus A380. So an Airbus A380, for those of you who don't know-- and you've probably flown in this before if you've gone from one continent to another-- is essentially the most amazing airplane that has ever been invented. This plane is so sophisticated that it can basically fly itself. If everything goes right in an Airbus A380 flight, the pilot will fly the plane for about eight minutes-- four minutes when it takes off, four minutes when it lands. The other 14 hours it can stay aloft; the plane flies itself. The autopilot is amazing. And, in fact, it could take off and land itself, but people get freaked out about that. So the pilot does that because they've got to earn their salary somehow. And this flight, Qantas flight 32 that takes off on this morning in 2010, it takes off in a picture perfect day. There's not a cloud in the sky. The pilot glides into the air. He actually likes flying, so he flies it for about 12 or 15 minutes before he reaches over and he turns on the autopilot. And as he turns on the autopilot, he hears this noise like thousands of marbles being thrown against the hull or the fuselage of the plane. Now unbeknownst to him, what had just happened is that this freak accident had occurred. There had been a build up of grease on one of the fan blades that's attached to the shaft. And because there was enough oxygen in the air, this build up of grease it sparks and it catches fire. And it gets hot very, very quickly, and it causes this fan blade to detach. And because the jet engine is spinning so quickly, as the fan blade detaches, it starts to shoot through the wing. And it ends up punching this enormous hole in the wing of the plane. Now what's interesting though, is it turns out that this is not the bad thing that happened to Qantas flight 32-- the bad thing that happened to Qantas flight 32. Because an Airbus A380, it's so sophisticated, that the plane can actually sustain an injury like this and continue flying for 14 hours. The on-board computers will compensate for this loss in air speed and drag, and the plane will fly no problem. But the bad thing that happened is that as this fan blade detached, it hit another fan blade. And as it hit that second fan blade, it hit it at exactly the wrong angle of incidence that it caused it to explode into thousands of pieces. And those thousands of pieces, they start moving through the plane's wing and through the plane itself like shrapnel from a bomb. And they start cutting through hydraulics lines and fuel lines. Ultimately, it knocked out, in just under 30 seconds, 12 of the 14 systems that a plane needs to stay aloft. The captain flying the plane is this guy, Richard de Crespigny. And Richard de Crespigny he's reaching over to turn on the autopilot, and like it just lights up according to the logs that we have recovered. It lights up with alarms, and with these klaxons that start going off. Now Richard de Crespigny is an interesting guy. He was trained to fly by the Australian Air Force. When you're taught to fly by the Air Force, you're taught to think in a very specific way, a way of controlling your attention which corresponds to what we know about the neurology of attention. You're taught what's known as situational awareness. And everyone is familiar with this phrase. This phrase actually comes from aviation. And what it means is that you build mental models while things are going on. You tell yourself stories about what is occurring as it occurs, because what we know is that your brain relies on these stories to figure out what to pay attention to and what to safely ignore. Now Richard de Crespigny, he loved this stuff. He loved the story building. 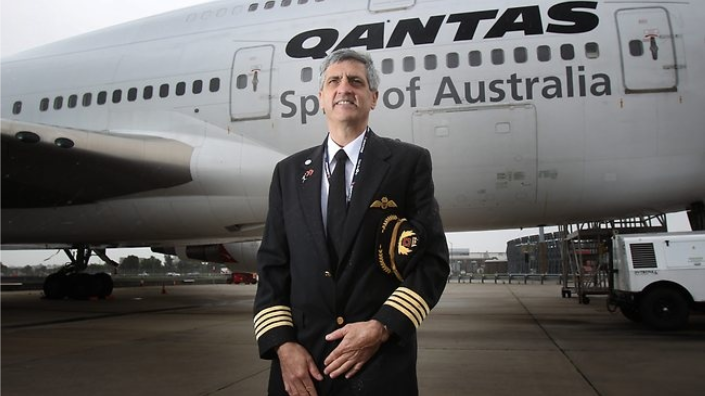 Before they had gotten on Qantas flight 32 that morning, he actually went through this conversation with his copilots that he'd go through before every single flight. As they were taking the shuttle from the hotel to the airport, he would say, tell me a story about what happens if engine 2 goes out. What are the first things you're going to do with your hands? What are the first words that are out of your mouth? Where are your eyes going to go? Where are your eyes going to go next? Tell me the most detailed story possible. And one of the things that we know is that this act of creating stories, telling ourselves stories, which all of you do, it is actually one of the things that distinguishes more successful people from less successful people. There was a study that was done on Fortune 500 executives, trying to figure out why some of them got promoted fastest. And the only commonality that could be found is that executives who tended to succeed faster than their peers, they tended to tell more detailed stories about their days. The average person would say, I'm going to go into that meeting, it starts at 11:00, I need to be out of there by 11:45. The best executives would say things like I'm to go into that meeting, it's going start at 11:00, it's going to start with Jim like bringing up some stupid idea that he always brings up, and Susan is going to disagree with him because there's like something weird going on there, and then I'm going to jump in and win the meeting as they're fighting with each other. This act of building more robust stories in our heads, it tends to allow us to pay attention better, focus better on the things that matter, and identify distractions faster. Now what's interesting is that in the middle of this emergency, as Richard de Crespigny is trying to pilot this plane, they've been flying for like 15 minutes. And basically they don't know what's going to happen. And there's all these alarms that are going off. And Richard de Crespigny does this incredibly interesting thing. In the middle of this crisis, he takes his hands off of the controls. He puts them into his lap, and he closes his eyes. And he says to himself, I have been trying, for the last half hour to tell myself a story about this plane as an Airbus A380. And the story inside my head is not working. I'm losing track of what's working and what isn't. I'm becoming overwhelmed by this information. So what he decides, is he decides in a split second to change the story in his head and just start pretending like he is flying the plane he learned to fly on-- a Cessna. Now how many folks in this room have ridden in a Cessna before? Like a Cessna has basically nothing in common with an Airbus A380. It's like comparing a Lamborghini and a motorcycle, except that it has the basics of flight. It can go up and down in the air, it has landing gear-- and Richard de Crespigny just decides, based on my training, I'm going to start pretending I'm flying a Cessna. And by now they've managed to turn the plane slightly around, and they're headed back to the Singapore airport. And as they're approaching the airport, air traffic control comes on the radio. And they say the thing you're never supposed to say, which is they say, according to our computers, at the rate of speed you're approaching, you are going to crash and die as soon as you set this plane down. And de Crespigny turns on his radio, and he says, it's OK, I got it, I'm flying a Cessna, and then turns off the radio. And his copilots like lose it, right? And they're getting closer and closer. And they come up to the longest runway in Singapore. And they set down. And the wheels don't explode. They don't die upon impact. And they're rushing down this runway. And according to the computers, even the on-board computers, they needed 2100 meters of runway to stop this plane. And de Crespigny-- and the runway is only 2000 meters long-- and de Crespigny is trying to figure out what to do. And he doesn't even know if the brakes work. And they're rushing down the runway. And the thing about Singapore, the longest runway, is it's surrounded by all these sand dunes. And if planes hit those sand dunes with too much speed, the plane will literally flip over and kill people who are on-board. And so they're rushing down the runway, and de Crespigny decides I'm going to break this plane the same way that I would break a Cessna, which is that you learn in flight school that if you have a Cessna and you're making an emergency landing, you just press the break down and then you hold it there and pray. And you can hear on the recording, he presses the break down, and you can hear him saying this little prayer. And again, his copilots are literally screaming at this point. And they can see the sand dunes coming past. And they can hear the metal groaning. And the brakes actually hold, right? But they're not holding enough. And they're trying to cascade off speed. And the wings are actually giving off this popping sound as they're trying to give off more and more speed. And they see the end of the runway getting closer and closer and closer. And they eventually stop with 100 meters of runway to spare. And 49 minutes later, all 269 people on-board that plane all walk off the plane without one injury. And they have tried to recreate this landing literally hundreds of times in simulators. They have had the best pilots on earth try and land this plane in a simulator. They had Sully, they probably had Tom Hanks do it, who knows. They had everyone come in-- never, not once, has anyone ever landed this plane without killing every single person on board in the simulator. And if you ask Richard de Crespigny why he was able to do this-- and I've spoken to him a dozen times-- he will tell you he has no idea. He will tell you that he doesn't know if he got lucky, maybe there was a gust of wind that stopped them, maybe things weren't as injured as they thought it was when it was in the air. He will tell you that the only decision he made that he is certain of is that he decided to take control of what he was thinking about. He decided to change the story in his head. He decided to pretend that he was flying a Cessna, which makes no sense, and he stopped reacting to all these emergencies in his environment and started pro-acting. But what's interesting, how this gets back to meaning is this, is that afterwards, when researchers talked to de Crespigny, and they talked to his copilots, and they talked to passengers, they all rated this experience, this near-death experience, as one of the most meaningful experiences of their life, which I think everyone would buy. So here's the thing is that everyone was trying to figure out, why? Why is it a meaningful experience when you have a brush with death? Why is Richard de Crespigny-- why does he say that this is one of the most meaningful moments of his life? And certainly some of it is stuff that we've been talking about, right? You push yourself beyond possible. You're achieving something that gives you a sense of satisfaction. But as researchers have looked at this, what they've also found is that there are certain preconditions that make it more likely, because other people have experienced other types of situations and they don't rate it as particularly meaningful. But what happened here is that we tend to see things as being more meaningful when we're with other people. And one of the things that comes through in Richard de Crespigny's story if you get into the details of it is that he's surrounded, not only by the passengers, but he's also in conversation with his copilots. Right, the fact that they're freaking out, that they don't know what's going on-- that's a huge part of why he says that this was important, was that hearing them give him this feedback made the moment seem more meaningful. And this gets to, I think, what we were talking about here with the finite and the excitement. One of the things that we know is that if you want to create the preconditions for having a meaningful moment, if it has this sense of awe, it's more likely that you will remember that as having meaning. You will learn something from that experience. It also has to contain a loss of ego. Right, so when you are landing a plane, when you are a Captain of a plane, when you are a passenger on that plane, you have to work as a team. And one of the things that researchers found from talking to de Crespigny and his colleagues is that they felt like they came together as a unit, that the copilots actually just trusted, even though they were freaked out, they trusted de Crespigny to make these choices. They gave up a sense of self and felt like they were being guided by some type of higher knowledge, or higher power, or just through some type of practice. And finally, you have to be reliant on others. And the reason why I bring this up is when we think about these hard, challenging memories, these moments that we all have in our lives, we have this opportunity to craft those. When you go into a hard moment, when you know something hard is coming up, the question becomes how do you frame that? So it becomes something meaningful to you as opposed to something that's just challenging. And what the science tells us is that there are these components, these things that we can do. We can look for these moments of awe. We can look for these moments where we have to commune with someone else. We can look for these moments where we have to rely on others. Those actually make the experience more meaningful. And to go back to what I sort of opened with, these happiness studies tend to focus on whether people are happy on a daily basis. And we should all aspire to be happy on a daily basis. But the way that we achieve happiness, the way that we find the precondition of meaningfulness that let's us be happy is that we in some ways do the opposite of this. We look for the opportunities when we don't have a still mind, when we don't feel easy love, when we aren't laughing, and we plunge into those opportunities, into that struggle, and into that work. Let me ask you, what is the most meaningful moments of your lives? Like tell me what has been meaningful to you. And if you had to distill this down for your kids as to why it was meaningful, the choices they should make to have moments like that, what would you tell them? As I was listening to this and kind of thinking about the narrative in my own life, the common thread was one, an element of perseverance and kind of a challenge that I'd overcome. And two was coming through it with a sense of being grateful at the end of it, whether it was-- I've had a couple of near-death experiences in my life. You know, or having children that were born prematurely and sitting in the NICU, right, you're grateful as you get through it. Or my wife putting up with me for over 20 years. All those things had elements of you had to put in a lot of effort, you had to struggle, but you came through it. Those, to me, stacked up to then create the top 10 list of most important and enduring memories, good and bad. Yeah, I think that makes a lot of sense. I think there's a common theme to what you've asked, though, in the premise of all of your questions, which is scarcity. You really are not asking us to come up with did you enjoy the 30 days you spent at the beach last summer? You're asking for the one specific time. And so the premise of it, I think there's an element to scarcity that creates that meaningfulness and awe, but there's this whole other element of what about not those one discrete moments, but the compilation of moments? So you talked about children and the pain that comes from having them, but it's that culmination of all the little moments. So I can point to individual moments that I've had with my kids, but maybe the most special to me, perhaps, as a father, is the compilation of all of it together, almost the collage in my mind, if you will. And I think that this is actually the thing that I'm sort of moving towards, and I think is the big takeaway, is that you're exactly right. When we think about meaningfulness, and I force you to think of it in terms of these moments, that's not how we live, right? We live full complete days. We live a string of moments, most of which we actually forget. But I also think that we tend to, or there is an instinct, for most people, to look for meaningfulness as something that happens to us. We have a great vacation, and we're thankful that we do. We have a great marriage, and we put work into it, but we're thankful that fate brought us that, that I happened to meet the person I'm supposed to marry. And actually, everything that we're learning lines up with exactly what you just said. We create meaning by making choices about the story we tell ourselves about our life. And that what we know about people who don't succeed is that they don't create that story. They don't author it. The story happens to them. Everyone in this room creates their own story. That's why we were at HBS, is because we created a story that brought us to HBS and that brings us success afterwards. As we get older, we tend to forget how malleable those stories can be. We lose the opportunities to see awe everyday. We start forgetting that we ought to pause and remember this. Oftentimes we need something, like a near-death experience, to remind us of what actually matters. I guess what I'm hoping-- and you guys can all tell me if this was useful or not-- is that we don't need near-death experiences. We don't need something to remind us to pause, that we gain these tools of investing each other, of cultivating a sense of awe, of trying to make life harder in some respects because we know that we can learn things that challenge our preconceptions through struggle, to make every day more meaningful. And as a result, end up laughing, and loving, and having more passion because we are crafting meaningful lives instead of just happy ones.